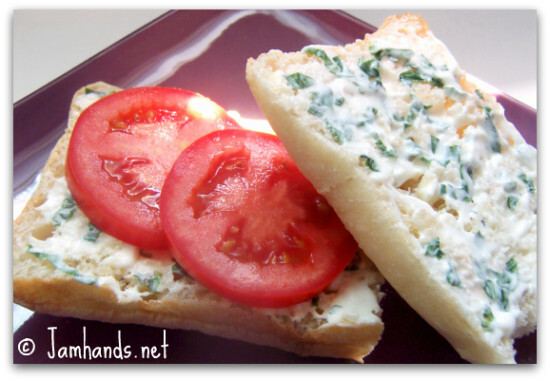 Although the sandwich is very basic, the tasty basil mayo adds a ton of flavor. According to Ina, this is for 1 serving, so if you are only making one sandwich you can scale back the mayo ingredients. I did that just using whatever looked right for the amounts and taste tested it along the way. If you make the full recipe for the mayo you will want to store it in the fridge and use it up within a couple days. Ready for the recipe? 1. Whisk together the mayonnaise, basil, salt, pepper, lemon juice, olive oil and garlic. Spread the mayonnaise mixture on the top of 2 slices of bread. Place the sliced tomato on top of one bread slice. Place the remaining slice of bread, mayonnaise side down, on top of the tomato. Cut the sandwich in half and serve. that does look delicious. Although I might be inclined to throw on a slice of provolone. There is a local restaurant here, the Spicy Pickle, that makes a sandwich very similar to this, but they put fresh mozzarella and grill it like a panini. SOOOOO good--it is totally my favorite! 1 Cup of Mayo? Yeah, that's a bit much. I would add shredded mozzarella cheese in with the mayo mixture..this sounds amazing!